To get some perspective about the St. Pete Arts scene, earlier in the month I sat down with Rob Davidson and his staff of Davidson's Fine Art Gallery to get the view of a long time member of the St. Petersburg Arts scene. This is the third of a 5 Post series where Rob Davidson talks about his Gallery, the Arts in St. Pete and how he sees the future of the arts in St. Petersburg. "Let's talk about the St. Pete art scene. From your perspective, how are things going in the arts district." I asked? Rob begins, "I think it's great. I think it is a real grass roots kind of thing it's happening on its own. It's not like the City is saying, let's start a bunch of galleries up and down Central Avenue, it's just kind of happening." "I think the City kind of likes to attach to that, but it's happening on its own. I don't think the City is driving the arts scene, the arts scene is driving the City." "I am getting people through the doors that come in for the art supplies that say I was living in California and I just like St. Pete and I moved here for the art." Rob continues, "I think there is this kind of grass roots thing that is happening with all of these artists coming together combined with a low cost of living and nice weather, along with everything else this area has going for it. So you can be a new artist and come here and it's not like going to Manhattan or something and stepping off the bus and saying ok whose going to show my work?" "Here you will find someone to show your work. There are enough small galleries here that if you want to take the time and work your career up this is a terrific town to do it. There are plenty of places to display your work." Rob continued, "There is kind of a gorilla aspect to it with all the murals and art that you can't sell. There is art done for art. For me, that's giving new color to the City and its attracting artists who want to work in this way. It seems like the whole City is open to art." "The City sees art is the future. It's not the base ball team. Art is the thing that's going to bring people here and you also have the baby boom generation who are retiring and moving down here and they are not your typical retirees. They want things to do, they want to go out to art shows and concerts and they want to create art themselves. There are a lot of frustrated artists who have had to pursue their working career an now they are retired and they can actually start"
"You got this young kind of hipster crowd, the graffiti artists and older artists. We have one who just turned a hundred and he can barely see but he's still painting." How is the tourist foot traffic in the arts district during the weekday and on the weekends? "Yes this block is blossoming. This whole block was empty when Marina moved in to Art Pool, she used to be down a block away from us on first north. She does a great job of promoting her Gallery; it brings a lot of people. We have Haslem's Bookstore right across the street and they are a St. Pete icon." "People want to be able to live here and walk to entertainment and stores. It's like the malls killed the downtown and now downtown is killing the malls. People are coming back downtown where they can walk around and find exciting things to do." In the next Post Rob talks about the Art walks, and what it will take to move the St. Pete Arts District to the next level. 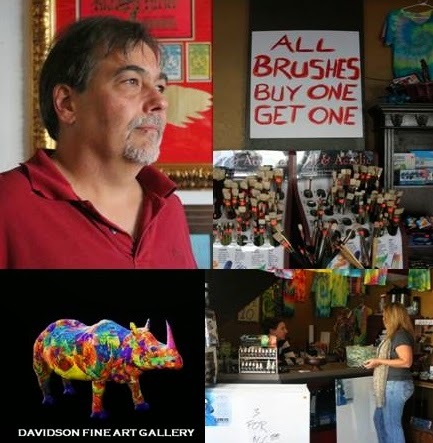 The Davidson Fine Art Gallery us located at 2036 Central Avenue, St. Petersburg, FL 33712, the Phone Number is 727-827-1888. Right across the Street from Haslems Book Store. E-mail Doc at: dr.webb@verizon.net. Or send me a Facebook (Gene Webb) Friend request. Twitter@DOCONTHEBAY. Please comment below, and be sure to share on Facebook and Twitter.